We have lift access available up to all floors. All rooms have disabled access, apart from the Mayor’s Parlour and Wykeham room. Are there any restaurant facilities on site? We have an on site café on the ground floor called eighteen71 – find out more here. When hiring a room you will receive 10% off in the cafe on the day of your event for any delegates, exhibitors or attendees. Is Wi-Fi access available to guests? Guildhall offers standard Wi-Fi throughout the venue. Please contact the team to ensure your service demands can be met. Is there a bar at the Guildhall? There is a built in bar in the Wintonian, Walton and Courtyard and we can build a mobile bar in the Bapsy Hall and King Charles Hall. There is a minimum spend of £400 when we run a bar service. What kind of events can the Guildhall be hired for? We offer a range or rooms to suit different events – Conferences, Parties, Weddings, Exhibitions, Networking Events and many more. Please speak to our sales team for more information on hiring an event space. Do you have a car park, or where is the nearest parking facility? We have 6 spaces which we can hire out to event clients, on a first come first served basis. We recommend parking in any of the city centre car parks, as we are located at the bottom of the high street. We also recommend using the East Park and Ride service as it drops right outside the Guildhall. Are any audio visual equipment included with the room hire? We have a list of additional extras for hire, or can recommend external AV companies – please get in touch with a member of the sales team about your requirements. Is any furniture included when hiring a room? We can have the room set up ready for you on arrival. The room hire includes the use of trestle or round tables, and our standard chairs. Banqueting chairs and poseur tables can be hired at an additional cost. We have a cloakroom which can be used for events. This can be used free of charge unmanned or manned by one of our members of staff for an additional fee. Are there hotels within walking distance? We are based in the centre at the bottom of the high street, and many hotels are located within walking distance or a short taxi ride away. More information can be found through the Tourist Information Centre located on the ground floor of the Guildhall. Is there public transport close to the venue? The Bus Station is located opposite the Guildhall, and the train station is a 15 minute walk away. There is a taxi rank located outside of the Guildhall. Can I bring my dog inside of the venue? Only Guide Dogs are allowed within the venue. How do I book tickets for events held at the Guildhall? If the event is being run by us, the tickets will be on sale in the box office located in the Tourist Information Centre on the ground floor. They are also available to buy online. Any events being run by a 3rd party company, will be selling the tickets themselves. Please give us a call if you are unsure on who is selling tickets – 01962 840 820. With regards to private hire events, children may attend, although they must be supervised by an adult at all times. It’s always best to check in advance with public events, as the age range can differ with each event, so please check before you buy. Is there a cash point on site/can I pay by card? We can take either cash or card payment at during events. Unfortunately we don’t have a cash point on site, but there are many located up the high street. If paying on the door for a public event, we ask that you pay in cash. I’ve lost an item at the Guildhall, do you have a lost property section? We do have a lost property section, just get in touch, and we can let you know if your item has been handed in, or take your details in case we find the item. How can I give feedback, or make a complaint? If hiring one of our rooms you will find feedback forms in each room, and we will send out a survey at the end of each month to the hirer. If you wish to make a formal complaint this can be done by email, over the phone, handing in a letter, or speaking to a member of staff. As per the Guildhall’s Feedback & Complaints procedure, all complaints must be acknowledged within 7 days of receiving the complaint. For further details of how we process complaints, please request the procedure. Will other events be held on the same day as mine? Other events can be held on the same day, unless you hire the venue exclusively. Please speak to a member of our events team, if you wish to exclusively hire the venue. Do the hire prices differ on weekends? Our hire rates are the same all days of the week, and all times of the year, but minimum room hire timings do apply. Please find this in our terms and conditions located here. Can we bring our own food/drink to events? The only room in which you are able to bring in your own food is the Courtyard. When hiring any of our other spaces, the catering must be provided by our in house team or one of our approved caterers. All drinks must be provided by the Guildhall however we can allow corkage on wine and champagne at a fee. Please speak to a member of our sales team for more information. Our Courtyard room, and Walton Suite both have outdoor space included in the hire. Abbey Gardens, or the Cathedral Grounds are located nearby, should you wish for outdoor photographs. These general booking conditions relate to your contract with Winchester City Council in hiring Guildhall Winchester and apply to all bookings at the Guildhall. You should take time to read them before signing your booking confirmation. You can download the document using the link on the right. The download is a PDF if you require a different format please contact us. 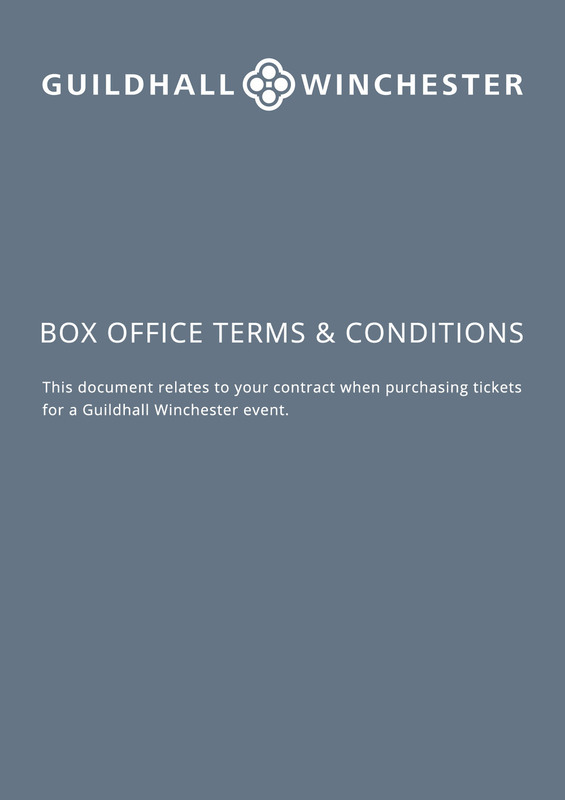 This document relates to your contract when purchasing tickets for a Guildhall Winchester event. 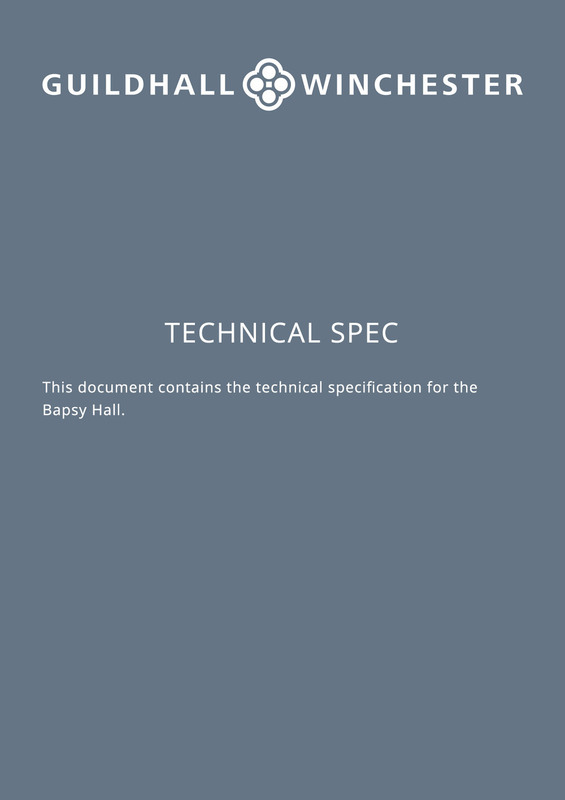 This document contains the technical specification for the Bapsy Hall. 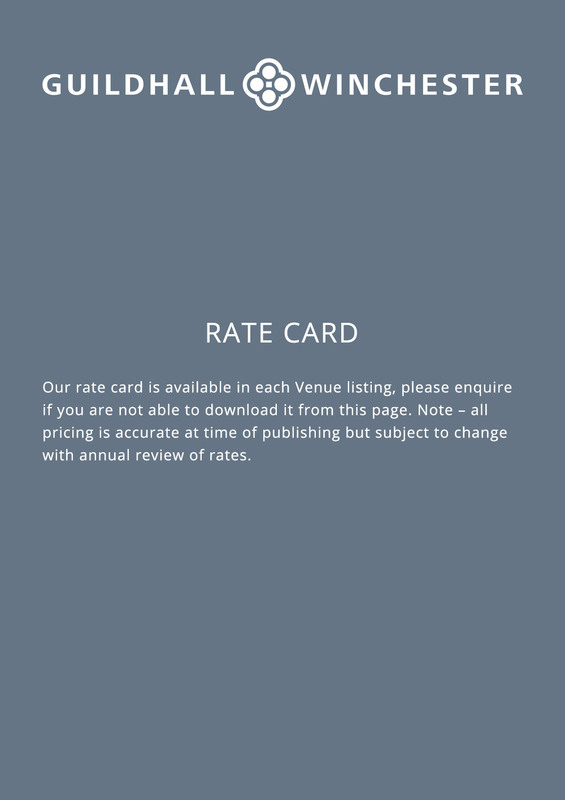 Our rate card is available in each Venue listing, please enquire if you are not able to download it from this page. Note – all pricing is accurate at time of publishing but subject to change with annual review of rates.